I had my hair done last December before waiting around 5-6 months before experimenting with John Frieda's Go Blonder, which I actually really liked. The trick to using the spray is to CONTINUE TO USE IT. I can't stress this enough people. I am an ash blonde naturally, and only using the spray twice might have lightened up my alright blonde highlights, but made my roots a muddy orange shade. No good. So use it 5-7 times, as directed, and you'll not only have beautiful sun-kissed highlights, but your roots will be a nice, true blonde as well. So, because I was using that product, my hair was growing out but it didn't look root-tastic, so I kept letting it grow and used the JF spray every now and then to brighten up. But my mom constantly nags on me when she sees my videos because she hates any kind of regrowth whatsoever and despises ombré, so I decided to appease her by hitting the salon and visiting my girl, Rae, at Byuti in Santa Monica. Byuti is the flagship location for Pureology in Los Angeles, and I really like the way Rae works with my hair. She's a peach and really fun to go see. And she creates beautiful, natural color! But I tend to notice that with Redken/Pureology that my hair doesn't take to the color, and it ends up looking more yellow -- even with a toner or gloss -- than pale blonde. Even if at the beginning it looks good, it starts to look brassy by week two. The only coloring products I've found that don't do this (for my hair specifically)? Aveda and Wella. I know my mom loves Redken, so it really depends on your hair. I can't tell you what makes your hair turn brassy or not, unfortunately. But once you find a color that works, be sure to ask your colorist so you know your formula in the event you move or your colorist moves! I forgot to mention that I had shot a video on how to balayage highlight your own hair back in May, so I had to learn how to do my own highlights and I really loved the results. I used Clairol Professional 7th Stage Creme Hair Lightener with a 30 volume developer and the accompanying lightening activators you buy with it, and it turned out great (after a few test patches, mind you). Just a reminder that I'm naturally a blonde anyway, so lifting my hair to a lighter shade of blonde was not an issue. If I were brunette or red, I would not have attempted this at all. 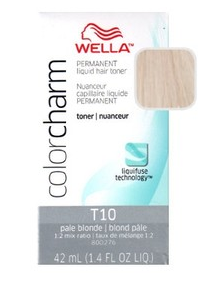 Toner used: Wella Color Charm T-10, otherwise known as "Ivory Lady" -- before it was discontinued and renamed "Pale Blonde"
My mom was a licensed cosmetologist, but hasn't practiced in years. So while she does know a lot, she wasn't sure about toning my already-been-highlighted-for-weeks hair. The first test patch was left on the longest (10 minutes) and it turned the blonde in my hair to a grey-lilac shade. Think Kelly Osbourne. So I looked up this issue and people were said not to leave it in that long -- the box indicates you should leave it on 20-30 minutes -- so I tried it again with the rest of my hair and left it on 2-3 minutes before hopping in the shower. It did the same thing to the rest of my hair, and here's why: this is only for hair that's been freshly colored. Also, if you are trying to take the brassiness out of your hair, I'd opt for T-18 instead of T-10 -- I feel like you can get too much of a purple tint if you use it even slightly the wrong way. Anyway, my hair is great now, thanks to Aveda color! Just a side note... if you do want to tone your hair, you need to use developer. At first I thought we could avoid this, but to deposit the color, you need to use at least a 10 or 20 developer, depending on what the toner package says. And if you notice that your blonde highlights are more coppery-gold than a pale yellow, it's because your color technician isn't leaving your highlights in for as long as they need to be. Just tell them upfront your hair tends to turn a little yellow/orange and that you think it's because the color never stays on long enough. Also, you might be wondering if I looked up how to get rid the purple in my hair. Yes, yes I did. But here's the thing -- the ideas out there would work if my hair was a single process, or in English, all-over color. But because my hair is highlighted, getting the purple out is more difficult. I read that putting hydrogen peroxide in your shampoo will do the trick, but I was hesistant to try it for fear it would strip the other shades in my hair. And we asked a sales rep at Sally's, and she recommended a color corrector, but considering that strips ALL of the color from your hair (not your natural color, but any dye that has been used), I didn't want to do that either, or else all of my highlights and lowlights would be completely gone. If you do have brassy hair, try a purple shampoo once a week. DON'T go overboard or else you can have blue or purple hair like I experienced earlier this year! Clairol and Ion have great options to choose from here. I also like L'Oreal's Colorist Secrets Brass Banisher, which is a gloss that leaves your hair shiny and brass-free! Good luck, and if you have any questions, be sure to comment and I can try to help. Thanks so much for this! I bleached my hair but it's still brassy and I was trying to figure out what to do! 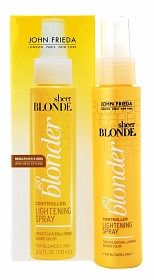 I would love to start dying my own hair blonde, and I was super excited when you mentioned a spray that does it for you! My heart sank when you said that this wasn't for brunettes though, because the older I'm getting the darker my hair is. I've tried dying it before and it just turned that brassy color you were talking about. I'll probably just stick to going to salons to get it done.